My name is Antonio Naranjo and I began studying hospitality, but couldn’t decide if I wanted to be a chef or a butler. I thought I needed to find a job that combined the two, so I started bartending 8 years ago and haven’t looked back. 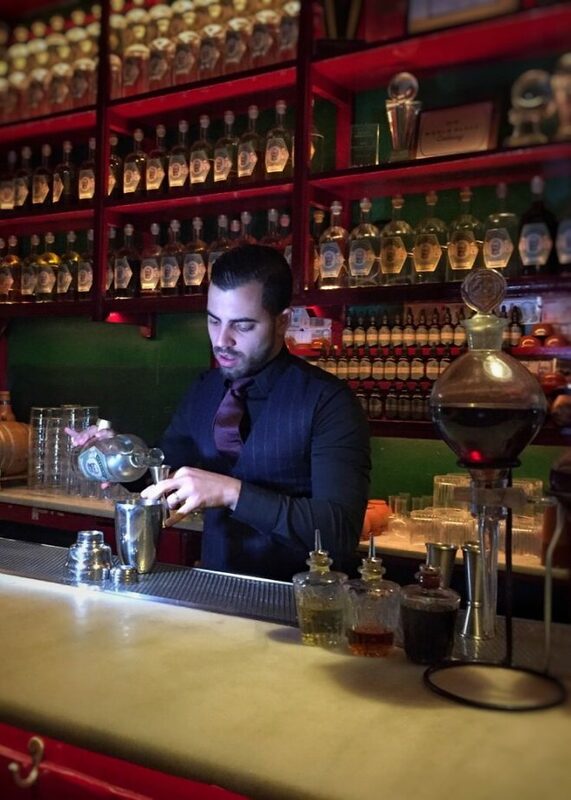 I moved to Barcelona to learn more about how to make good cocktails and continue growing as a bartender. I then moved to Sevilla and eventually moved to Norway where I worked at Himkok which was a real game changer. I learnt about everything from products and maceration to different flavours. This period inspired the way we work at Dr Stravinsky and I even create my own gin here with a rotovap. We have created our bar so it looks like a vintage chemist or apothecary with all the bottles looking the same with generic labels, because for us, it’s about the drink and not the brands we use. I love Dr. Stravinky, it’s my place, but I would love to open a cabaret with a great show and good cocktails. My father played the trumpet in Cuba in a cabaret, where you could dance and watch magicians, so I would like to re-create a big place like that in Cuba. It would be split in three different areas between a cabaret and a circus so you could come with the family. It would have a vintage/retro style. I try to spend most of my time with my wife and my child, a new part of my life, but we still try to combine that with going out for dinner. As you can see in the video, it’s rum, white rum. Even when you clarify white rum, to keep the flavour and the complexity, it’s hard work. My first drink was rum, a daiquiri in Cuba, (I was only ten) so it’s in my blood. I really like Botran blanco and the National white rum from Jamaica is a good too, especially for a daiquiri. It’s a combination of different ingredients. Knowledge first, then love and passion and third… method. In the end, it’s about chatting with your clients, because they are the best people to know what they want to drink. If the client doesn’t know, we drive him through the menu because it’s a patchwork of different flavours: sour, bitter, sweet, spicy, dry, lactic… The most important thing is to try and find what the client likes. I love sherry because it’s the second part my life. After Cuba, it’s Andalusia, and sherry offers the biggest map of flavours. It adds a lot of complexity to a drink: extra dryness, sweetness, saltiness, umami… My favourite sherry is palo cortado, because it’s a mix of saltiness, dryness and a touch of oxidation. In Cuba, you have to go to Floridita and find Alejandro Bolivar, he is the head bartender and has lot’s of stories to tell. He is like a bible for drinks. In Barcelona go to Boada the oldest bar in the city and ask for Adal Marqués and Geronimo (the youngest and oldest bartenders in the place). And the last one, and he is my idol, is Ago Perrone from the Connaught Bar.